rule number 17 quite clearly states: "team kit is for members of the team. wearing pro team kit is also questionable if you're not paid to wear it. If you must fly the colors of pro teams, all garments should match perfectly, i.e no mapei jersey with kelme shorts and telekom socks." it's a rule and/or sentiment with which i would normally tend to agree, even if only from a commercial point of view. the guys in the team have their salaries paid courtesy the team sponsors, and it is therefore incumbent upon them to sport the corporate logo at every possible occasion. this extends to days off, and particularly if being interviewed for a feature in procycling or cyclist magazines. you and me, however, in a serious case of volte face are required to pay for the privilege of advertising the sponsors' wares, all the while living in fear of being ridiculed for sporting more than just a pair of trade team gloves or socks. applying a degree of rationality to the situation, i doubt i'm the only one who has come across a rather overweight football fan, wearing his team's jersey and making it plain for all to see that he, quite frankly, isn't wayne rooney (sorry 'bout that; it's the only football player i know). yet aside from a mental snigger, the hypothetical gentleman in question receives no lambasting as he decides which particular brand of kitchen roll should go in the trolley. in fact, as far as i'm aware, even fans of competing clubs have little problem with this state of affairs. probably because they do exactly the same themselves. so, while most of us are aware that velominati's rules of cycling are ever so slightly tongue-in-cheek, why do we take great delight in the endless ribbing of one of our own who turns up to the sunday ride clad in the kit of his/her favourite team? and if it really is a major velocipedinal faux pas, why do so many offer replica team kit? i mean, who is buying it in the first place? as far as most of the tabloid newspapers and one or two of the broadsheets are concerned, sport is merely a euphemism for football, and the customary wearing of team tops even for doing the weekly shop raises barely an eyebrow midst the civilian population. surely doing likewise with cycling kit cannot harm the cause? even though i'm pretty sure that alejandro valverde would be unlikely to wear his endura made race jersey for domestic purposes. i cannot deny that i benefit locally from perceived eccentricity. you and i know that i'm as normal as the next member of the peloton, but it's very unlikely that the population of islay have the faintest notion that i don't always ride the same bicycle and nor do i wear the same apparel on my various sorties when surveying the estates. and let me assure you that this has nothing to do with riding at a speed that depicts me as a blur in the rear view mirror; i'm simply not that fast. therefore, on the first sunny day to have hit this far west in i don't know how long, my taking in one or two of the less salubrious roads across the principality, dressed head to toe in movistar team kit neither lessened nor increased that perceived eccentricity. 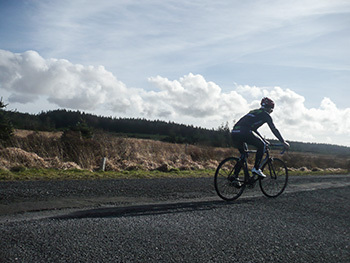 scotland's endura cycle clothing have made a highly successful concerted effort to associate themselves with road cycling, firstly via their domestic continental endura team and more recently with the conitinental pro net app endura squad. there is no doubt whatsoever that owning and part-owning their own teams has had a major effect on the quality and fit of their clothing. the endura equipe range is easily amongst the best in the world. 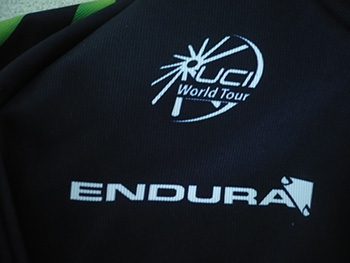 2014, however, has seen endura make the enormous step up to world tour status by providing the clothing for the spanish movistar squad. though work has been churning in the background for the past couple of years to make sure they hit the ground running, a bit like formula one motor racing, the very top does not suffer fools gladly. endura sent me a jersey, bibshorts, leg warmers, arm warmers, team socks and a movistar logo'd neckwarmer. all these were more than welcome, for though the sun was out, sunburn is still a good few months in the distance. the only bits missing were a canyon team bike (i wonder...?) and a catlike helmet. other than that, you'd have sworn blind i'd simply taken a wrong turning in paris-nice. the grippers on the hem of the shorts are so thin, yet so grippy, i'd to pay attention when pulling them on; no wonder we shave our legs. the leg warmers are of a heavier material than either the shorts or jersey, backed with a roubaix-like fleece and zippered at the back. doing so means a far easier time can be had when removing them if the pace gets too hot. the attention to detail has stretched as far as curving the zip toggles to make them more ergonomic in use. the armwarmers, minus the zips, are of similar constitution as those intended for your legs. 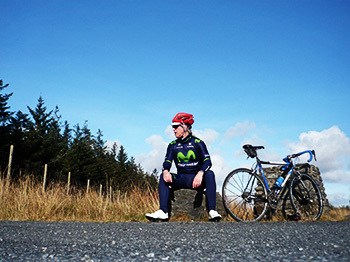 it is surely pure coincidence that the movistar logo features more than just a soupcon of lime green, for that is the colour of seat pad you'll find in the equipe range as well as in the replica shorts. (i might point out that when endura say replica they mean we get exactly the same stuff as valverde, quintana et al. this is not a cheaper alternative.) the padding in the shorts is so darned good that you'd scarcely notice it was there; not too thick, not too thin. my bum cossetted just like a professional. the (short sleeve) jersey has the same impossibly thin grippy bits at the end of the sleeves, again meaning care and attention when donning, for believe me, that stuff grips everything, and that includes the outside of the armwarmers. the top ends of both leg and armwarmers are hemmed with silicon gloop that does an excellent job of keeping them right where you want them. neither moved a millimetre during any of the review rides. it almost goes without saying that neither the shorts nor the sleeves gave any trouble either. the jersey features substantially sized three rear pockets, though no zipped security pocket because that's what the team volvo is for and the miracle coating cold black has also been incorporated into its fabric to prevent heat absorption even on hot days like what we never get. 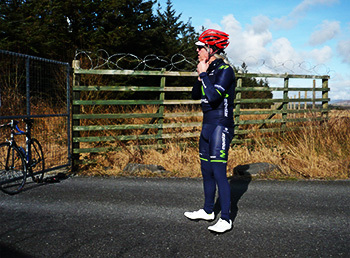 the fit is marvellous (medium size reviewed) as is that of the bibshorts (small size reviewed). the mesh bibs do a marvellous job of easing pressure on the shoulders while the tell-tale awkwardness off the bike attests to their true, race-fit purpose in life. 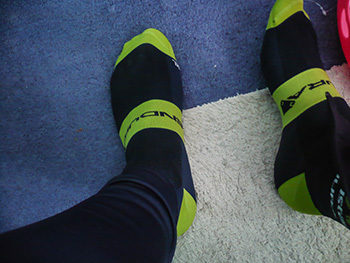 the socks were the only bit of kit that gave me a problem but not in the way you might think. 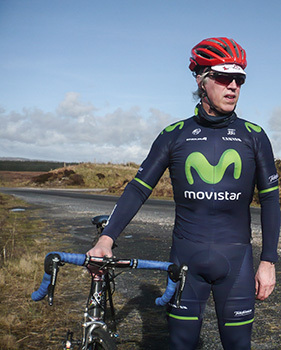 should i have worn them under the leg-warmers, or should i have given movistar even more square centimetres of publicity by placing them over the top? in practice, i hid the logos inside the leg-warmers, but only because the zip irritated my left ankle. needless to say, when sorching heat and windless days (who am i kidding?) approach from the west, i'll let the air whistle round those bare, muscular calfs with ankles clearly displaying that funky letter 'm'.